There are 9 on-site restaurants as well as 5 lounges and bars located on-site. Guests can enjoy a variety of cuisine, including buffets, fine steak and seafood and classic Italian dishes, created by world-class chefs. Experience luxurious accommodations, unrivaled personalized services and non-stop entertainment and excitement at this elegant resort spa and casino, situated on the south strip Las Vegas, close to Interstate 15. 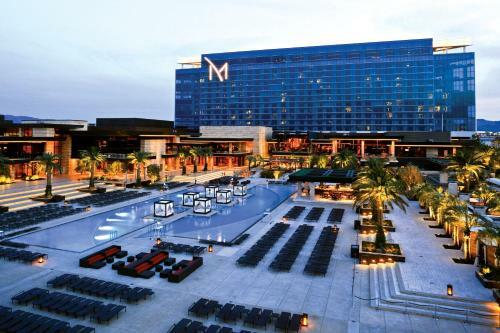 The M Resort Spa and Casino provides everything needed for a memorable stay. Relax with a massage from the full-service spa, enjoy a gourmet meal at one of the 9 on-site restaurants or take advantage of live nightly entertainment. The hotel also boasts a spacious gaming floor, complete with slot machines and card games. The hotel offers the Ravello Lounge and 6 Bars (M Bar, Lobby Bar, Terzetto Bar, 32 Draft Bar, Veloce Bar, Red Cup Bar) Guests at the M Resort are provided with access to nearby top-rated golf courses. Luxury shopping is also only minutes away, and easily accessible with the hotel's shopping shuttle service. The hotel also offers free shuttle service to the nearby McCarran International Airport. The Hostile Grape at the M Resort Spa Casino Las Vegas features wines around the world and has 160 wines by the glass available in this contemporary cellar.